One of the biggest questions entering Florida’s 2019-20 season will be what kind of production they can get from Gorjok Gak, their 6’11” 250 pound center who took a medical redshirt last year and fell out of the conversation when it came to Florida basketball. Having arthroscopic knee surgery after the 2017-18 season he was optimistically projected to be available for the start of the 2018-19 campaign but when his knee continued to swell after every workout well into the winter it was announced he would be sitting out the remainder of the year. Unfortunately the knee problem hasn’t been the only issue plaguing Gak throughout his career as foot issues also contributed to him missing practices and games in his first two years in orange and blue and realistically we have never really seen Gak play at 100% health or anything close to that. 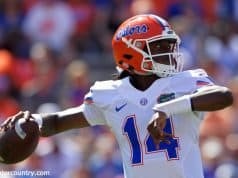 Considering it has been nearly a calendar year since his surgery and by the time workouts in August commence it will have been 16 months since the surgery there is some reason to believe he’ll be ready to fire on all cylinders when the Gators open their season and if so, how can we expect him to contribute? Let’s take a look at what he brought when he was playing to see what he could bring. Just a note, the numbers I reference for Gak will be from the 2017-18 season, given his redshirt the past year. Florida has a boatload of bigs but doesn’t have anything close to a clear starter after graduating Kevarrius Hayes. 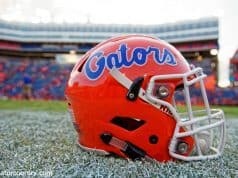 Dontay Bassett, Isaiah Stokes, Omar Payne, Jason Jitoboh, and Gorjok Gak are all bigs suited better at the 5 than the 4 and while the talk of the Gators picking up a graduate transfer center to fill the starting role is still hot as the roster sits today it looks like there will be a battle to see who will be taking the tip on the first game of the season. Bassett is the returning center who played the most minutes (even though it was only 11.3 minutes per game) so you could potentially consider him to be the frontrunner for this role but at the same time it’s looking like the starting spot is wide open. Even if a clear starter doesn’t emerge it could be center by committee and if so the Gators could really use some quality play from the redshirt-junior Gak. Considering Gak is 6’11” with a 7’4” wingspan you probably want to look at what impact he could have on the defensive end first. Replacing Kevarrius Hayes’ tremendous rim protection is going to be an issue for a Florida team that could really pressure on the perimeter knowing they had Hayes to mop up any mistakes behind them. While Gak hasn’t had great shot blocking numbers in his first two seasons of play he has contested shots well and has really good numbers protecting the tin. Opponents only shot 37.5% at hoop when contested by Gak and that is a fantastic number given the fact the national average hovers around 54%. His pure size allows him to go straight up and contest shots and when opponents try to push into his body to create space he’s got the bulk to take a hit and keep his position. Even though the percentage he allowed at the rim was impressive when you watch the tape that number is a bit misleading because he doesn’t get to a ton of shots near the rim. He doesn’t have great speed side-to-side and that doesn’t allow him to rotate over very quickly from the weak side. I say that fully knowing he wasn’t totally healthy at the time and if recovered he could be moving better but I’m definitely not expecting him to be a Hayes-level rim protector. However, if he is able to stay near the hoop and not have to move far to protect the rim he shoot be an impactful interior defender. Dontay Bassett allowed a high percentage at the rim (albeit on a fairly small sample size) which is not optimal from your center and if Gak can be a significantly better defender at the rim he could command minutes. Securing the glass was not a strength for the Gators last season and the inability to finish defensive possessions at times really hurt them. While Gak’s size and length hypothetically should contribute to dominant rebounding numbers we haven’t seen that from him quite yet and I think he has some room for growth in that area. His 16.4% defensive rebounding rate would have been 4th on the team this year (coming in behind Keith Stone at 3rd who took some heat for his rebounding before his injury) so it’s not like we can really expect him to come in and instantly be an impactful rebounder but he should still help. He was a strong offensive rebounder which shows a nose for the ball which will hopefully start manifesting itself on the defensive glass as well. While offensive rebounding is great it’s defensive rebounding that the Gators really need to improve on and if Gak can use his size positively to control the boards he could command minutes. Offensive production from the center spot hasn’t been a strength of Florida basketball the last two seasons but Kevarrius Hayes was providing some valuable interior buckets near the end of the season and replacing some of those points will be one of Coach White’s focuses. Gak showed some decent finishing ability in 2018 shooting a tidy 61.8% on the inside and if he can keep that up he’ll find himself the beneficiary of a lot of spectacular pocket passes that should lead to dunks. Gak has been limited in his offensive arsenal up until this point in his career but if he can set good screens, roll to the hoop, and finish inside when he gets fed the basketball that’s most of what the team could require. He also could use a bit of practice passing out of double teams and hitting shooters as he didn’t quite have the feel for that through his first two seasons but he’s got the length to find passing lanes and if he can get confident in that area he should really help the team. Watching his offensive possessions he also had some flashes of effectiveness as a screen and roll finisher and that will be something interesting to watch next season since the Gators were not very good at pick and roll last season. If he were to differentiate himself as the biggest roll threat he could find himself earning a lot more minutes. A lot of the improvements I think Gak needs to make revolve around his foot speed and lateral dexterity and in saying that I acknowledge that the fact he’s never been totally healthy could have played a major role in his heavy-footedness. The fact of the matter is that in modern basketball defense is much more important in your center than offense and whoever plays the best defense amongst the Gator centers will command minutes and for Gak to be the best possible defender he’ll need to get better moving laterally. Dontay Bassett and Isaiah Stokes both had their moments getting played off the floor due to their struggles guarding in pick and roll and in space and Gak could find himself in the same situation unless he can get quicker or become excellent in his positioning. Also, if Gak wants to find himself on the floor late in games he’s going to need to improve his free throw shooting as the dismal 39.3% he shot as a sophomore won’t be good enough to keep him in games late. Unless Florida lands a marquee graduate transfer at the 5 there is going to be some competition for the starting spot and Gak should factor into it due to his size and the length he’ll bring to the floor. 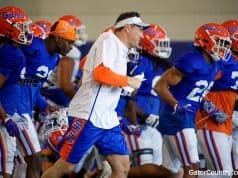 Expecting him to play at high level after a year and half without playing a game would probably be far too optimistic but the break could mean we get to see him at full health for the first time in his career and at that point we can really see what the Gators have in him. 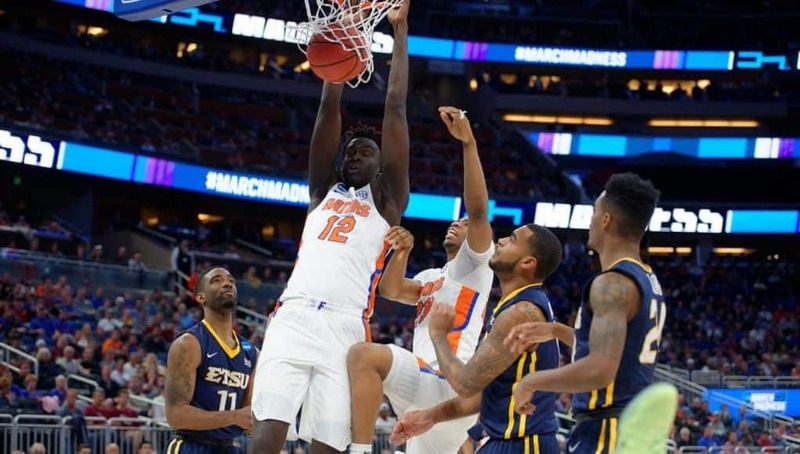 Above average size in the frontcourt hasn’t been something the Gators have had since Egbunu and Gak could provide that so there is some reason to think positively about who could be the most mysterious Florida player entering the 2019 season.